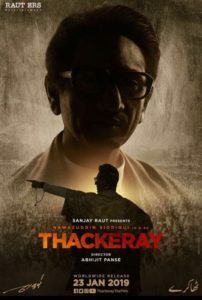 Bal Thackeray… sorry Balasaheb Thackeray(in the film an unsuspecting character gets slapped by a Shiv Sena soldier for saying the Demi God’s name without the reverential suffix) played the chauvinistic card with a masterminded focus. He knew how to tap the Marathi Manoos’ latent pride and also how to harness it into a violent outpouring. Many of his opponents, including the unfortunate Morarjee Desai(unfortunate, as he is played by Rajesh Khera) thought of his campaign to cleanse Maharashtra to be almost a ratification of Hitler’s Nazism. Think Jews. Think Bihar and UP’s Bhaiyyas and the South Indian Udipi restaurateurs being chased out of Mumbai by violent Sainiks. Think Hitler. Think Trump. If you spot the difference, let me know. The film on Balasaheb certainly doesn’t squander the opportunity to portray the man as infinitely intolerant of migrants.Yes the Great Man wanted scums out of his state. That he was indeed in favour of ousting migrants from Maharashtra was a well-known fact. But did anyone ever think that his blatant chauvinism Andre his politics of ethnic cleansing would one day be so unabashedly celebrated on celluloid? Writer-director Abhijeet Panse celebrates Balasaheb’s spirit of separateness with a straightforwardness that we immediately recognize as a sign of traditional entitlement which sanctions certain behaviour among males as “normal”. Just as it is “normal” for women to fry pakodas in the kitchen while men crack sexist jokes in the drawingroom, it is “normal” for a national leader to make flagrant speeches about bajoing the pungi of people in a lungi. (The censor board of course forgot that the Constitution allows freedom of expression only as long as it doesn’t hurt the sentiments of any community or individual). For outsiders—and who is not an outsider these days?—the normalizing of cultural marginalization may seem like a celebration of a culture of anarchy and despotism.Sanctioning bloodbaths is not something we associate with charismatic national leaders. But here he is, Nawazuddin Siddiqui playing Balasaheb as a man who wanted Maharashtra only for Marathis. Mr Siddiqui plays Balasaheb as impatient intolerant man of many words and even more action. At the start we see him quit his job as a cartoonist to start his own Marathi paper. In Panse’s Maharashtra in the 1950s there are migrants everywhere jostling pushing and bullying Marathis on the streets and out of their jobs.Something has to be done and who better equipped to tap into Marathi pride with a hammer? Nawaz and the film’s director choose to over look the irony of an ethnic leader saying nation always comes first to him. “I always say Jai Hind first, and then Jai Maharashtra,” Nawazuddin’s Balasaheb tells Avantika Akerkar’s Indira Gandhi proudly. Mrs G’s arched eyebrow at that declaration is truly a chart-topping moment in a film that legitimizes hooliganism and elevates extra-constitutional muscle power to the summits of validation.There are some interesting unknown actors playing Balasaheb’s devotees and I just loved the veteran who plays his father and mocks the ‘Saheb’ in his son’s name in a way no one else would dare. Come to think of it,this could have been a great mythological film if only there was not so much violence and bloodshed. But hey, there is also redemption. After a brutal communal riot we see Balasheb bring a Muslim family to his home . He even allows the man to do his namaaz in his livingroom. And you still think ethnic cleansing is unethical?